Brand new for 2018, MEAN WELL’s HRPG-1000 series is a compact power supply capable of delivering 1000 watts of output power. This product comes with built in Power Factor Correction (PFC) of greater than 0.95, which enables the product to meet the harmonic current requirements of EN61000-3-2. Equipped with a variable speed cooling fan, the HRPG-1000 can operate in acoustic sensitive environments. During light loading, or cooler environments, the power supply internal fan rotates at a reduced speed to minimize audible noise. The HRPG-1000 high efficiency allowed the mechanical designers of the product to use the same mechanical case as the HRPG-600, 600 watt product. Existing HRPG-600 users can increase power within their system without a new mechanical layout. Up to 4 units of the HRPG-1000 may be operated in parallel, delivering up to 4000 watts of output power. Additionally, the HRPG-1000 can be employed in a system requiring redundant power. In this case, 4 HRPG-1000 units can be configured in a 3+1 redundant wiring scheme. 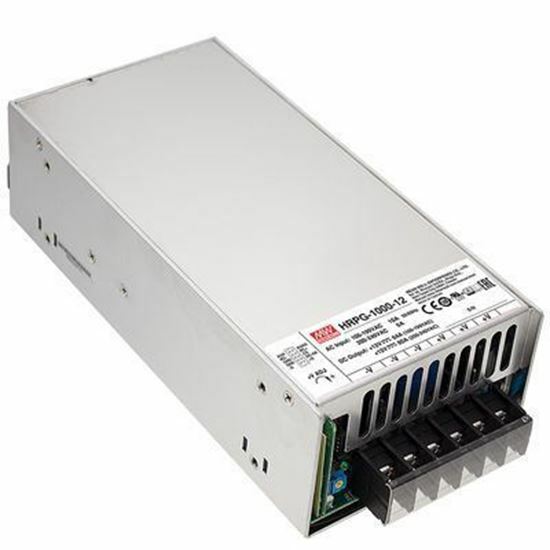 MEAN WELL's HRPG-1000 also has a standard auxiliary output that provides 5Vdc at 300mA. This aux output is always powered and can provide standby power for low power circuits. UL and TUV approvals have been obtained to meet IEC 62368-1. HRPG-1000 safety compliances allow for faster approvals of end products in the ITE market, including transmission, audio and communication devices.